A fiery sunset, the wind howling like it always does in hills and a precarious perch with the shutter open for 2 seconds, camera mounted on a sturdy tripod. The euphoria of getting a keeper soon evaporates when you realise that you are in the same mess that you've been getting into quite frequently these days - far away from civilization with a light drizzle that turns into a storm. 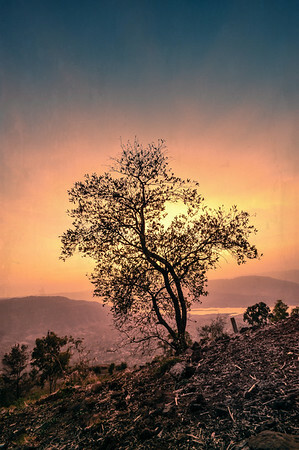 I curse myself for wanting to shoot sunsets that look different and wearily begin the climb down the hill in the dark. Nostalgia is a dirty liar that insists things were better than they seemed!